Highland Square Neighborhood Association was awarded a Knight Arts Challenge grant to make an Akron Film Festival happen in our neighborhood! 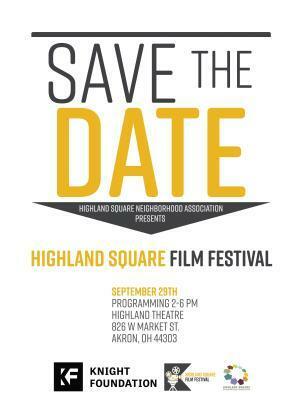 We are so excited to host this event at our very own, Highland Theatre! We have invited local film makers/enthusiasts to head up a panel discussion from 2-3pm lead by special guest speaker, Rhea Butcher! Programming will be from 3:30-5:30pm with an award ceremony that directly follows with over $1,000 in cash prizes for the 1st and 2nd place winners! We will also have an Audience Choice Award for the crowds favorite film!